Want to skip to the results? View the Cassis Capital website HERE. Cassis & Cassis Capital LLC invests in ventures ranging from real estate, private companies and more. They required a single page website to communicate their wide portfolio of businesses, as well as the markets they invest in. Their existing website was a old fashion, template website from GoDaddy. The site didn’t work on mobile devices, and had light across many pages – more than necessary. The goal was to have a website that was clear, professional and minimal, with a clear route for contact. As with all websites, user journey is core and needs to be thought about. When you’re working with a single page website, you only have one chance to tell the audience exactly what you’re trying to get across. The result was a slick, fast loading, single page website. The content on the website is clear and digestible, with minimal use of photography. 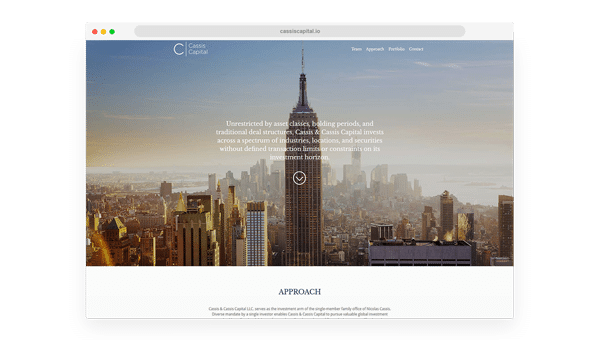 We chose a strong New York skyline photo for the site’s header because of the location Cassis Capital comes from, but also because of what New York represents to the public – a financial powerhouse and one of the busiest cities in America. To view the Cassis Capital website, just click HERE.